LOWER MANHATTAN, New York (WABC) -- The NYPD officer who fired the shot that struck West Side Highway terror suspect Sayfullo Saipov is being hailed a hero. Ryan Nash, 28, is a five-year veteran of the department and is assigned to the First Precinct, where he was one of the first officers to respond to the scene. Two other officers responded with Officer Nash at the time. The officers then saw the suspect, who appeared to be waving a gun and yelling at the scene of the accident and observed the people down on the scene. Office Nash then took action and fired his service weapon, bringing the attack to an end. 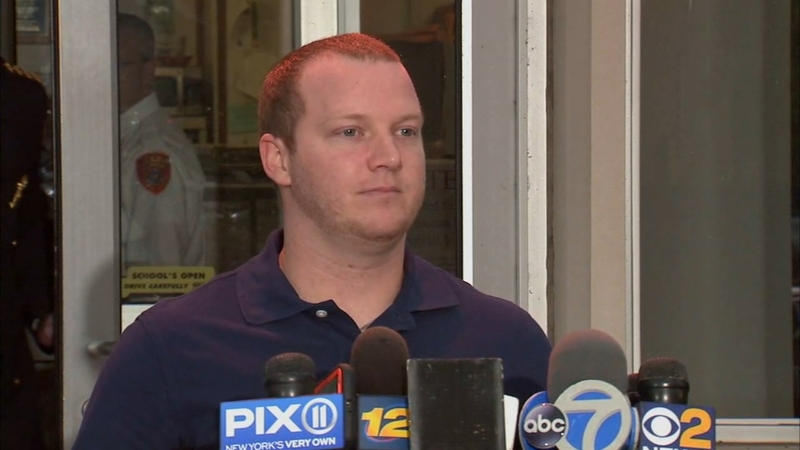 "So in typical fashion of an NYPD cop, he thinks what he did was not an act of heroism. He thinks it's something that -- why he joined the police department," Police Commissioner James O'Neill said. Police Commissioner James O'Neill praises Officer Ryan Nash, NYPD. Commissioner O'Neill said he met with Officer Nash on Tuesday night. "He was at the hospital, and I don't think we could find a more humble human being," he added. O'Neill said that the officers were at Stuyvesant High School for an unrelated call, and someone came in and told them there was an accident at West and Chambers Street. "All New Yorkers should be thankful to Ryan and his partner. They showed great courage. And I talk about the courage of the men and women in this police department every day," O'Neill added. Watch NYPD Officer Ryan Nash's full statement following the announcement that he took down the terror suspect in Lower Manhattan. Officer Nash was treated and released at New York Presbyterian Hospital for tinnitus, or ringing in the ears, following the shooting. He lives in Medford, Long Island with his girlfriend and has two awards for Excellent Police Duty and one for Meritorious Police Duty from the NYPD.